JNN 13 Apr 2015 Sydney : Anti-Islam protests in Australia against Sharia law and halal tax turned violent after demonstrators clashed with anti-racism activists who burned the country’s flag. Police were forced to separate the Reclaim Australia supporters and opponents of the group in Melbourne, after clashes turned ugly and several people had to be treated by paramedics. The protests came as companies seeking to label their foods halal – must pay fees to Islamic organisations for inspection and certification. Recent figures show the halal sector could be worth $1.5 trillion worldwide by 2050. Across the country, 16 rallies were scheduled to take place, with events in Sydney and Melbourne appearing to have drawn the biggest crowds. About 500 people attended the rally held in Martin Place, Sydney, which included speeches from former Australia Defence League member Shermon Burgess and Rise Up! Australia Party NSW President Norm Bishop. There was a strong police presence throughout the protest, which included riot police. Two people were taken away by officers after they rushed the stage and attempted to disrupt the rally. One took the microphone and told the crowd they should be ‘ashamed’. In Melbourne, protesters clashed with anti-racism activists in Federation Square. Two people were arrested after they attempted to break through a police barricade that separated the different groups. Several more were injured in the combative protests, according to reports. 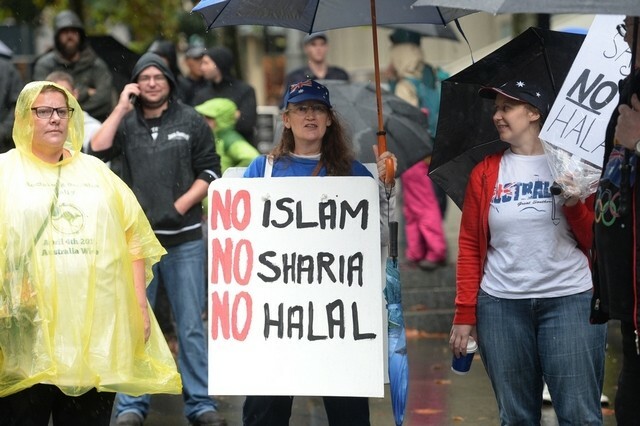 The protests came as the Pauline Hanson, leader of One Nation, far right Australian political party, defended the anti-Islam protests and said imposing halal certification on Australians was wrong. On Sunday morning’s Today show she was asked for her views on businesses ‘going to the wall’ if halal certification of food products was scrapped. ‘It’s a profit, money-making racket and has been connected with the Muslim Brotherhood in France. Why can’t we have an investigation into where the money actually goes?’ she claimed. Ms Hanson added that an investigation was needed into halal certification in Australia. ‘It’s extortion that has been put onto businesses that you must pay this money,’ she said. ‘A Muslim does not have to have halal certification, they can say a prayer over their food. Then it’s OK.
Ms Hanson, who narrowly lost her fight for a seat in the 2015 Queensland election, joined hundreds of protesters in King George Square in Brisbane on Saturday. Many were draped in the Australian flag and carried signs denouncing sharia law and halal certification for Australian products. She denied that there was any violence or vitriol at the rally. ‘There was no violence at the Brisbane rally whatsoever. Islam is not a race so therefore we’re not talking about racism here whatsoever. Criticism is not racism. We have a right to have a say and have an opinion,’ she said. The violent scenes came after a Twitter account claiming to be linked with anti-Islam groups has mocked protests being held around Australia. It was originally thought Reclaim Australia had handed over the reigns to one of their supporters to control their feed throughout the protests. ‘Whats wrong with muslims anyway? I dun get it,’ one tweet from the account read. ‘In the car reading stuff – wots xenophobia? help me out,’ another said. However, ‘Jeremy’ began to tweet a number of joke comments shortly after the Sydney protest got underway. Once the tweets began to get attention, a ‘statement’ was released that explained its account was misused and it then said other events around the country would be cancelled. However, organisers behind the Sydney protest were quick to disassociate themselves with the account. Twitter users quickly began to poke fun at the group after doubts over the page emerged. ‘Maybe before you you practice on something small like reclaiming your Twitter account. Work up to the big stuff slowly,’ one said. This entry was posted in Europe and tagged Anti Islam, Australia, Racism, Rallies. Bookmark the permalink.